Dream Products Catalog, online at dreamproductscatalog.com, is the online source for personal care and home items at affordable prices. Dream Products Catalog carries a wide selection of handbags, wallets, bras, slimming garments, diabetic socks, insoles, foot care, bakeware, cookware, kitchen accessories, home electronics, anti-wrinkle products, beauty and health products, automotive tools and accessories, BBQ and picnic supplies, lawn and garden decor, and so much more. But before you shop, get all the latest dreamproductscatalog.com discounts, Dream Products Catalog promotions, and Dream Products Catalog coupon codes found here at RetailSteal.com. 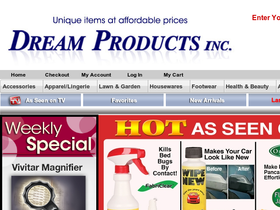 Dream Products Catalog offers free delivery on all orders, and delivers within the United States and APO/FPO addresses. See site for more information. Enjoy 10% savings, free shipping and free gifts with your purchase from Dream Product Catalog using this coupon code. Save up to 25% or more on Last Chance products at Dream Product Catalog. Click here to shop. Use this coupon code online at Dream Products Catalog and you'll get a free men's diamond watch with orders of $70+. Enjoy free shipping and a free surprise gift with every purchase from Dream Products Catalog. Click here to shop today and save. Get free shipping on all As Seen on TV products form Dream Products Catalog. Click here to shop today. Shop for diabetic socks from just $5 at Dream Products Catalog. Click here to shop. Get two free gifts with your purchase form Dream Products Catalog. Click here to shop and enjoy this perk with purchases $30+. Shop at Dream Products Catalog for the Lifetime Techna-Ear for only $30. Click here to shop and save on this hearing aid. Shop for beauty products starting as low as $2 from Dream Products Catalog. Click here to shop and save today. Shop at DreamProductsCatalog.com and find a wide selection of bras starting as low as $4. Shop today and save. Shop Dream Products Catalog today and save big online with daily specials. Sign up for the Dream Products Catalog email newsletter and receive 10% off for next purchase. Save 20% and get free shipping on your coupon organizer purchase from Dream Products Catalog when you enter this coupon code! Save 20% on your Dream Products Catalog purchase and receive free shipping and a free gift when you use this promotional code! Offer valid on all footwear. Receive a free gift of a porcelain trinket box from Dream Products online when you use our coupon code with your purchase today.